Ensuring an efficient, innovative and competitive financial services industry is critical to the future growth and prosperity of the UK economy, especially as we enter a post-Brexit world. A strong mid-tier banking sector is a critical component to ensuring the health of the industry, customer service and innovation. 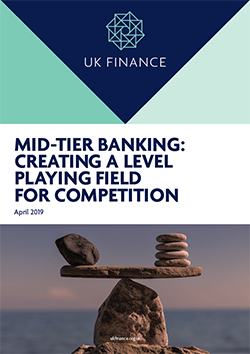 In this report we look at the challenges in achieving a strong mid-tier financial sector in a market where regulation can be disproportionate and constitute a barrier to growth. We identify a number of changes that, if introduced, could help to ensure a more level playing field, leading to greater competition in the UK banking and finance market.